Companies using San Francisco city bus stops to pick up and drop off passengers on commuter shuttles will have to pay more than triple the cost to the city. The San Francisco Municipal Transportation Agency board of directors voted to approve a fee increase from $1 per stop per day to $3.55 after realizing that the cost of enforcing the pilot program was more than originally anticipated. The new fee would take effect later this year and rise to $3.67 next year. The pilot program, which went into effect on July 1, allows companies operating shuttle buses to use San Francisco Municipal Railway bus stops for a fee to limit the impact of the shuttles on city bus service. 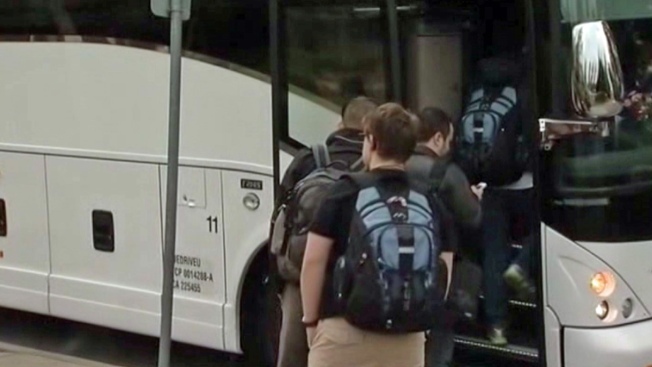 The program was started in response to a backlash against technology companies on the Peninsula and South Bay such as Google, Apple, Yahoo and Facebook running commuter shuttles for employees living in San Francisco. Critics argued that the shuttles took up city resources and impacted rents in San Francisco by encouraging highly paid workers to move there. The $1 fee had to be revised after SFMTA officials realized that the costs of the project were going to be much more than the $1.6 million originally anticipated, and that the number of stops per day was fewer than expected -- only 2,449 were requested from shuttle providers of an expected 4,100, SFMTA officials said. One objection raised at Tuesday's meeting was from the Mission Bay Transit Management Association, which operates small shuttles that run to and from the Mission Bay neighborhood, which they said was mandated by the city's redevelopment plan. The shuttles run between the Caltrain station, the Powell Street BART station and the Mission Bay neighborhood and are intended as a first-and-last-stop solution for people who have few transit options for getting there, Corinne Woods of the Mission Bay Citizens Advisory Committee said Tuesday. The Mission Bay TMA is a non-profit enterprise that charges a fee to property owners in the area to operate the service. Mission Bay has seen a huge influx of new residents and businesses recently but still has few public transit options, "so the shuttle service is really critical," Woods said. Several speakers argued to the SFMTA board that the Mission Bay shuttles should not be charged the same fees as the large corporate buses operating regionally and that the proposed fee increase could cripple the shuttle service's operating budget. SFMTA board chairman Tom Nolan said the speakers on the Mission Bay shuttles "raised a good point." Carli Paine, an SFMTA transportation manager, told the board that early on in designing the pilot the staff realized that about 80 percent of the shuttles using Muni stops were taking passengers to destinations within San Francisco, while the other 20 percent took passengers to destinations outside the city. She said that they looked into the possibility of a tiered pricing system for different kinds of shuttles, but that the San Francisco City Attorney's Office advised them that was impermissible. Sara Shortt, who is named as a plaintiff in a lawsuit trying to block the pilot program, said at Tuesday's meeting that the increased fees were "a step in the right direction." Shortt is part of a group that filed the suit in May over concerns that the shuttle buses are causing an influx of highly paid workers from the Silicon Valley area into the city, driving up rents and housing costs. The group previously tried to block the program through the city's Board of Supervisors, but the appeal was voted down. She said, though, that the city could see costs of enforcement rise as the buses use parking spots or idle in the street rather than stop at bus stops to avoid paying the fees. Living on Valencia Street, she said she has seen some commuter buses do this already. Emily Loper, a policy associate for the Bay Area Council praised today's decision, saying that the commuter shuttles were "innovative transportation" taking cars off the road and taking the pressure off stressed public transit services. "The benefits are immense," she said.